In recent years, the observation of single protein molecules has made a phenomenal development, and it has become possible to observe molecular dynamics in vivo at high-speed and with high accuracy. 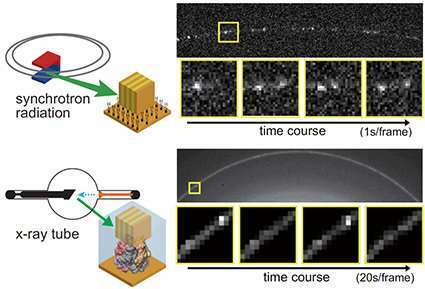 In conventional DXT (Diffracted X-ray Tracking), by labeling with a gold nanocrystal a specific site of a target protein molecule and by observing the positional change of the diffracted X-ray spots from the labeled gold nanocrystal with time-resolution of micro-second and pico-meter precision, we could successfully measure the internal motions of single molecules using DXT. Professor Yuji C. Sasaki of from the University of Tokyo, his japan research group and Dr. L.M.G. Chavas of from the French Synchrotron SOLEIL have succeeded in a new X-ray diffraction experiment using monochromatic X-rays at a synchrotron radiation facility. 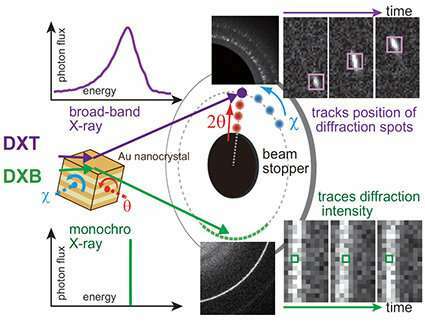 They confirmed the blinking phenomenon due to the motions of labeled gold nanocrystals for the first time in the world, and showed that by analyzing autocorrelation, it is possible to quantitatively evaluate the motion velocity of diffracted X-ray spots. In the new single molecule observation method, that we called Diffracted X-ray Blinking (DXB, Fig.1), using this monochromatic X-rays, when compared with DXT, which can record internal monomolecular dynamics, X-ray exposure of 1 / 1,700 was necessary and sufficient. Therefore, by using the diffracted X-ray blinking observation as shown in Fig.2, it is possible to perform dynamic observations of a single molecule with an amazing low X-ray dose. Furthermore, we also demonstrated that it is possible to measure single molecule motions on a laboratory X-ray source at the millisecond level utilizing this low exposure characteristic. This paper appeared in Scientific Reports on 30th November.